"I spent less time in my head or researching, and more time translating purely from instinct, from the body." Today, we continue our spotlight on the winners of Asymptote’s annual Close Approximations translation contest, now into its 3rd edition. (Find the official results and citations by judges David Bellos and Sawako Nakayasu here.) From 215 fiction and 128 poetry submissions, these six best emerging translators were awarded 3,000 USD in prize money, in addition to publication in our Summer 2017 edition. After interviews with fiction winner Suchitra Ramachandran and fiction runners-up Brian Bergstrom and Clarissa Botsford, today we have poetry runner-up Sarah Timmer Harvey in conversation with Asymptote Assistant Interviews Editor, Claire Jacobson. Claire Jacobson (CJ): I loved reading your translation of several of Marieke Lucas Rijneveld’s poems from her collection Kalfsvlies (Calf’s Caul). What was it that drew you to this text and motivated you to translate it? 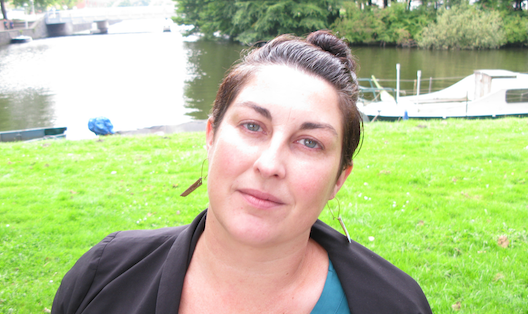 Sarah Timmer Harvey (STH): I first became aware of Rijneveld’s work through Dutch literary magazines and blogs in 2015, when Kalfsvlies was first published in the Netherlands by Atlas Contact, who have a great reputation for attracting and fostering exceptional writers. Both readers and critics seemed completely bowled over by Kalfsvlies, something rather unusual in the Netherlands, given the genre and Rijneveld’s youth, but once I read the collection, I understood why everyone was raving. The first line of the first poem in Kalfsvlies (Calf’s Caul) reads “How do you go to bed when you have just run over a sheep?” Now, that is an opening! I found it so incredibly brutal and compelling. I read the entire collection in one sitting and then, the next day, I began translating, purely for the pleasure of it. A little while later, I contacted Marieke Lucas to discuss doing something with my translations. To me, Rijneveld’s work feels quite rebellious—the narrative voice in Kalfsvlies is unfiltered and entirely unconcerned with establishing its authority. Rather, it is blatantly vulnerable and at times incredibly naïve considering the deeper themes at play: the death of a sibling, alcoholism, struggles with gender and sexuality, the confines of a rural upbringing. But Rijneveld’s youthful eye is also her strength, it draws the reader into a world that feels spontaneous, wildly intimate and full of unexpected wisdom. I can’t wait to read her debut novel, which will be published in the Netherlands (also by Atlas Contact) in October.